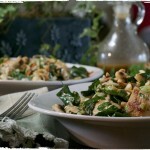 Roasted Peanut Kale Salad-What the "Forks" for Dinner? Kale is all the rage right now, and rightly so. It has crazy amounts of vitamins A, K, and C, and it’s packed with calcium. I must admit that I prefer spinach, and in a nutritional match up they are pretty equal. Although, spinach is a better source of iron, magnesium, and fiber. Be sure to buy either of these organic if possible. Leafy greens can be a sponge for any chemicals used in the growing process. Nutrition lesson over……..but look for our new page……coming soon, that will be all you wanted to know about nutrition, but were afraid to ask. This recipe is hopefully….fingers crossed, just what my friend Michelle was looking for. She had a salad at a restaurant in Chicago and tried to replicate it but, wasn’t happy with the result. Now, Michelle is one of the best cooks I know, so if she couldn’t come up with it I wasn’t sure I could either. But, I was willing to give it a try. Michelle described what was in the salad and the ingredients were fairly simple. 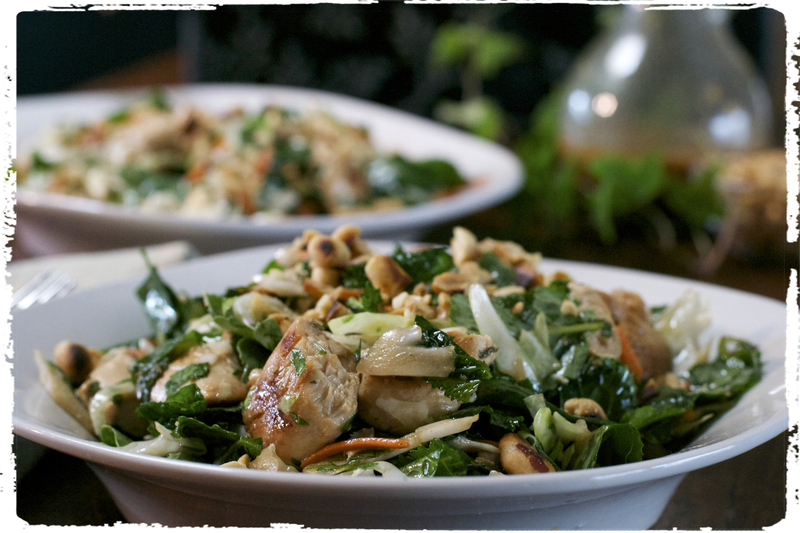 Kale, cabbage, mint, cilantro, parsley, and a peanut dressing. As I said before, I am not a huge fan of kale, but I tried a baby kale which I found to be a better taste. I will try this again with spinach. The dressing is where Michelle was stuck, so I hope my version…….peanut oil, rice wine vinegar, etc…….see recipe…..is the taste she was looking for. I added grilled chicken that I marinaded in the dressing for flavor, and and topped it with roasted peanuts. Both Tim and I really enjoyed it. 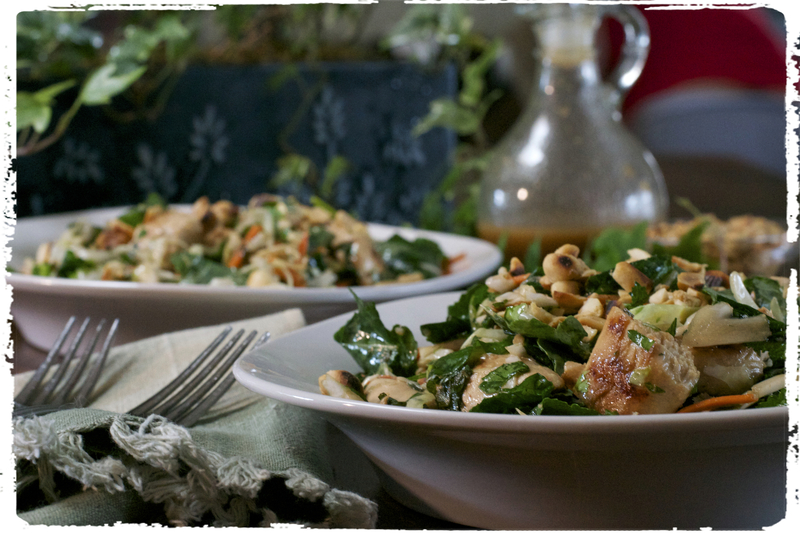 So, I hope my version of Roasted Peanut Kale Salad will be a close match for the restaurant salad……….let me know Michelle! Whisk all the dressing ingredients together and set aside. Add 1/4 cup of the dressing to chicken tenders and marinade for 30 minutes (or more). 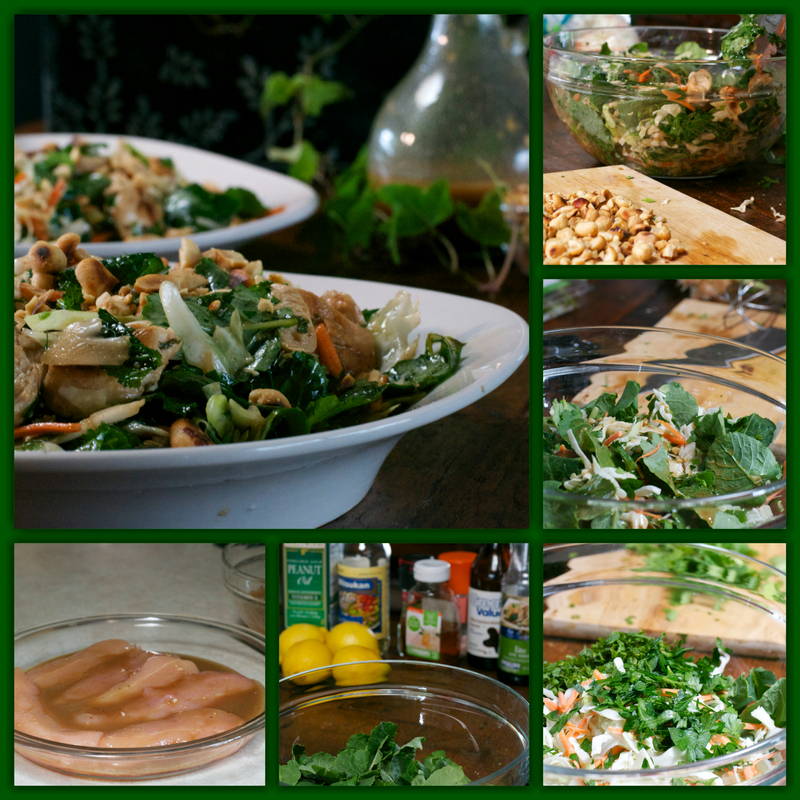 Combine all ingredients for the salad, except the peanuts and set aside. Remove chicken from marinade, discarding any remaining marinade. Grill chicken tenders over medium high heat until cooked through. Remove from grill and cut into bite size chunks and let cool slightly. Add chicken and dressing to the kale cabbage mixture. Toss to coat adding dressing as desired. Top with chopped peanuts and serve.